Augustus, the first Roman emperor, was born on the 23rd of September, B.C. 63, and was the son of C. Octavus by Atia, a daughter of Julia, the sister or C. Julius Caesar. 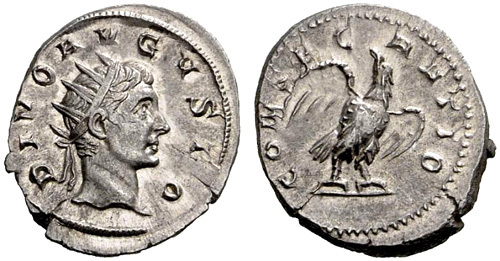 His original name was C. Octavius, and, after his adoption by his great-uncle, C. Julius Caesar Octavianus, but for the sake of brevity we shall call him Augustus, though this was only a title given him by the senate and the people in B.C. 27, to express their veneration for him. 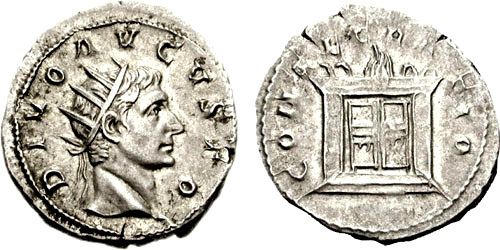 Obverse: DIVO AVGVSTO, Radiate head of Divus Augustus right. Reverse: CONSECRATIO, Large altar with two doors and flames on top. Obverse: DIVVS AVGVSTVS , laureate head right.